This Starbucks Holiday Gift Package is the perfect gift for any coffee lover in your life. For $46 dollars, you will get an 18 oz. Official Starbucks® Ceramic mug, a Stainless Steel Starbucks® Tumbler, Assorted Starbucks Selects® cookies (Choc Chip and Triple Choc Bliss! 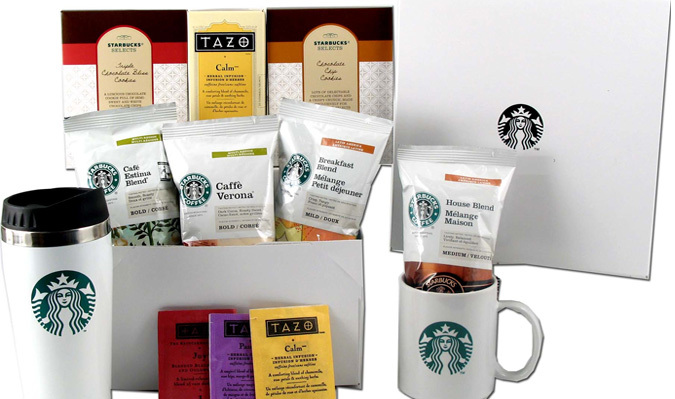 ), four bags of assorted flavors of Starbucks® coffee, with twenty four servings of assorted Tazo® Teas packed in a Starbucks® gift box, AND a personalized message card! Ahhhh sounds wonderful! You can buy up to five saves. See site for full details.